The group had a very eventful week. First campers worked diligently on finishing their first camp assignments and the group had two beautiful and successful hikes. Although a little chilly at times, the weather stayed gorgeous for us the whole week. Early in the week, we gave leadership to a new group of Brumbies: a logistics leader, emotional leader, and primary leader. The group had some really meaningful gatherings around family, masculinity, and forgiveness and finished the week strong by playing several games in the cool, autumn sunlight. The Dingos had a great week, with lovely weather, with only a couple of frosty mornings. We had two small hikes this week but the highlight was peaking Red Pine on Sunday. 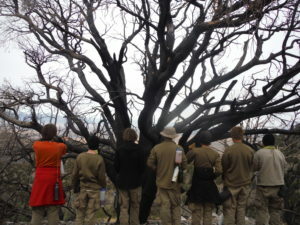 The group was very proud of their achievement and enjoyed the beautiful landscape. The group also met the challenge to bust their own coals to create fire and have been enjoying sharing different recipes when mealtimes come around. During groups we discussed a lot about family, relationships, and completed a genogram. Three Dingo’s were honored with tokens this week – Vital Fire, Solid Ground, and Seeker – and it seems the longer they are here the more confident students are becoming in their own ability to manage new tasks. By the end of the week, the group got into a groove of being supportive and encouraging towards each other and were focused on improving their busting skills in anticipation of winter. The Gnowees had a motion-filled week, with five hikes filled full of story sharing and story creation. We had a Gnowee get out of First Camp by finishing her pack and she excitedly joined the main group. Two of our girls had Parent Visits and they honored their family members with tokens. Enduring Wave honored her Dad with WingedHeart and gave her Mom Vital Fire. Whole-hearted Butterfly honored her Dad with Giver, as well as made a Keeper pouch with him. 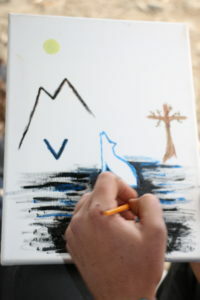 The group spent time painting together, and one of the Gnowees found a plank that the group members each painted a portion of as a group project. We had Gatherings focused this week on learning about and exploring anger and negative emotions, an affirmation circle was held, and activities that allowed us to identify the things in our life that matter most. The week was filled with beautiful sunsets, surprisingly warm weather, lots of Taylor Swift, and lots of laughter. The group also loved having Pepper, who was adorable.